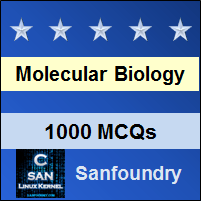 This set of Molecular Biology Multiple Choice Questions & Answers (MCQs) focuses on “How Is the Beginning of a Gene Recognized”. 1. What is the consensus sequence of the Pribnow box? Explanation: The Pribnow box is also known as the –10 promoter site. It was first recognized by Pribnow in 1975. It has a consensus sequence of TATAAT. 2. The Pribnow box is present on the coding strand of the DNA template. Explanation: The Pribnow box or the –10 sequence is present in the sense strand of DNA duplex. The sense strand is also known as the non – coding strand. It also harbors the other two conserved sequences for polymerase binding. Explanation: The –35 sequence is highly conserved in efficient promoters and has a consensus sequence of TTGACA. The first three positions of this hexameric sequence are the mostly conserved. 4. The +1 site of conserved promoter sequence is generally a pyrimidine. Explanation: The +1 site of conserved promoter sequence is the transcription start site and is 90% purine. “A” is more common than “G” and often have “C” and “T” on its either side. Explanation: Different sigma factors recognize different promoter sites. As σ70 sigma factor is the most common sigma factor the highly studied –10, – 35 and +1 sites of promoter belongs to it. 6. The RNA polymerase core enzyme has a high specificity for promoter sites and can perfectly work alone. Explanation: The RNA polymerase core enzyme has a high non – specific affinity for DNA. This is referred to as ‘loose binding’ and is not stable. Addition of σ factor converts the RNA polymerase core protein into a holoenzyme and also increases its specificity by 100 folds. Explanation: At the promoter the polymerase recognizes the –35 and the –10 sequence and tightly binds to it. The initial complex of the polymerase with the base paired promoter DNA is referred to as a closed complex. 8. Negative supercoiling enhances the rate of transcription. Explanation: Negative supercoiling enhances the rate of transcription of many genes. This is because it facilitates the unwinding of the DNA duplex by the RNA polymerase. 9. The –10 promoter region is rich in ______________ bases. Explanation: The –10 promoter region is rich in A, T bases. It has a consensus sequence of TATAAT and is also known as the Pribnow box. The presence of A and T is significant because the unwinding of DNA starts at this site and AT base parts melt easily than the GC base pairs.